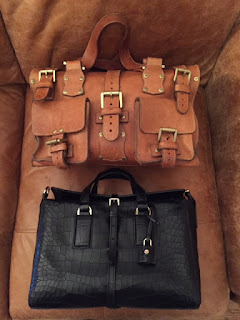 You might have seen one of my Mulberry Roxanne reviews. And maybe also my Roxette unboxing - though I just realised, I haven't done a proper review yet, so need to do that asap! Anyway, back to the here and now: the Roxette is often described as the modern take on the Roxanne, so I thought I'd do a quick comparison video. I need to state here that I am comparing the Small Roxette with the Roxanne, so you could argue that I should compare the Roxanne with the Regular Roxette but I don't have one of those and the Rosemary is a fair bit smaller that the Small Roxette. Fancy having a look? Measurements for your info at the bottom! Roxanne measures ca width 34 cm, depth 18 cm, height 19 cm. Handledrop is ca 22cm. Roxette measures ca width 30 cm, depth 14 cm, height 21 cm. Handledrop is ca 10cm - but you do get a long adjustable strap.